August | 2010 | Windancer - Stairway to ...Heaven? As I was describing in the previous episode – 4G to IMS call flow – Register to IMS – part 1 – the IP-CAN Session Establishment is scheduled for today. The procedure of IP-CAN (Connectivity Access Network) establishment is described in TS 23.203.
that connects that UE to the IMS APN. There are multiple ways of getting this IP address, ways varying from DHCP/DHCPv6, PPP and so on. With regards to IMS, the IP-CAN is given by the PGW, following the PCC rules from its local PCRF. But, before displaying the actual IP-CAN Session Establishment, let’s take a look at the functional entities and the architectures involved. The possible scenarios when talking about PCC (Policy and Charging Control) functionality, presented in TS 23.203. I have just copied the architecture pictures. The functional entities are described separately in the same TS 23.203 spec – section 6.2. Functional Entities. I will just underline, where the case requires, which entity from this “PCC Reference Architecture” matches which entity on the 4G architecture. The SPR logical entity contains all subscriber/subscription related information needed for subscription-based policies and IP‑CAN bearer level PCC rules by the PCRF. The SPR may be combined with or distributed across other databases in the operator’s network, but those functional elements and their requirements for the SPR are out of scope of this document. ** The SPR is connected to the PCRF via the Sp interface. The Application Function (AF) is an element offering applications that require dynamic policy and/or charging control over the IP‑CAN user plane behaviour. The AF shall communicate with the PCRF to transfer dynamic session information, required for PCRF decisions as well as to receive IP‑CAN specific information and notifications about IP‑CAN bearer level events. 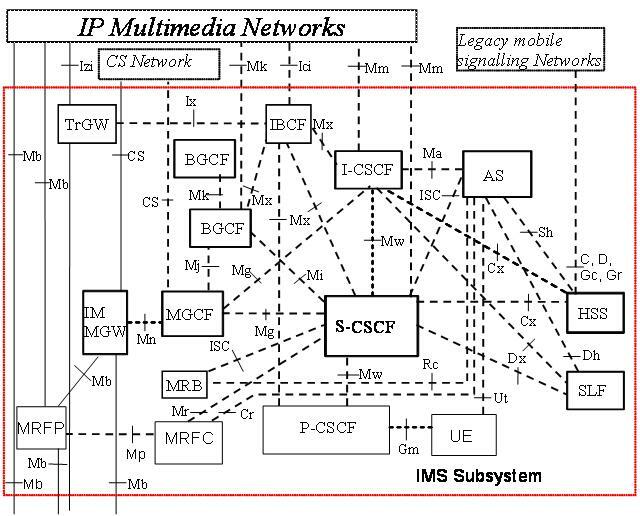 One example of an AF is the P‑CSCF of the IM CN subsystem. ** The AF is connected to the PCRF via the Rx interface. – The OCS is described in TS 32.240. In the PCC architecture we are only interested in its component called Service Data Flow Based Credit Control – its main purpose being to perform online credit control functions. ** The OCS is connected to the PCEF via the Gy interface. 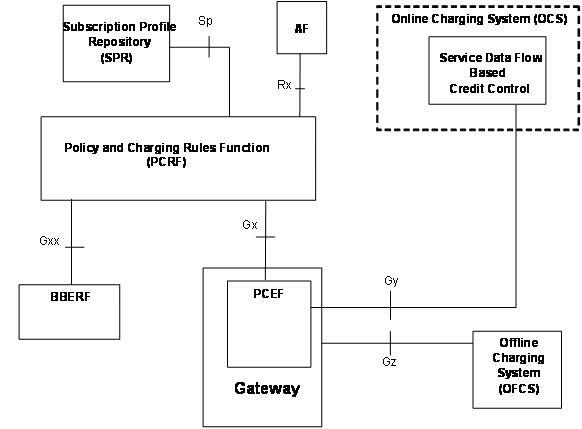 The PCRF encompasses policy control decision and flow based charging control functionalities. 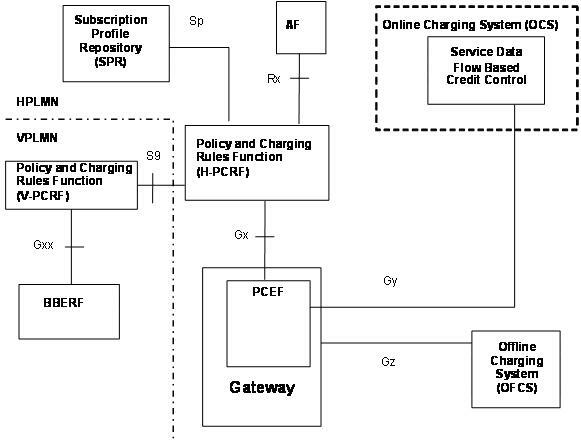 The PCRF provides network control regarding the service data flow detection, gating, QoS and flow based charging (except credit management) towards the PCEF. The PCRF shall apply the security procedures, as required by the operator, before accepting service information from the AF. – Uplink bearer binding verification. – Event reporting to the PCRF. – Sending or receiving IP‑CAN-specific parameters, to or from the PCRF. * Note: As far as I understand, and in order to somehow “map” the names of the “PCC” entities to the names of the “EPC” entities I’ve first learned about, I believe this BBERF role is actually played by the SGW as we know it from the EPC terminology. Please correct me if I’ve got this wrong. CORRECTION (further reading on TS 23.203): In the GTP-based 3GPP access network the BBERF entity does NOT apply. ** The BBERF is connected to the PCRF via the Gxx interface. The PCEF encompasses service data flow detection, policy enforcement and flow based charging functionalities. This functional entity is located at the Gateway (e.g. GGSN in the GPRS case, and PDG in the WLAN case). It provides service data flow detection, user plane traffic handling, triggering control plane session management (where the IP‑CAN permits), QoS handling, and service data flow measurement as well as online and offline charging interactions. *Note: The EPC entity assuming the role of the PCEF in the PCC Architecture is the PGW. The Offline Charging System is specified in TS 32.240 . There may be several OFCSs in a PLMN. The default OFCS addresses (i.e. the primary address and secondary address) shall be locally pre-configured within the PCEF. OFCS addresses may also be passed once per IP‑CAN session from the PCRF to the PCEF. The addresses provided by the PCRF shall have a higher priority than the pre-configured ones. ** The OFCS is connected to the PCEF via the Gz interface. 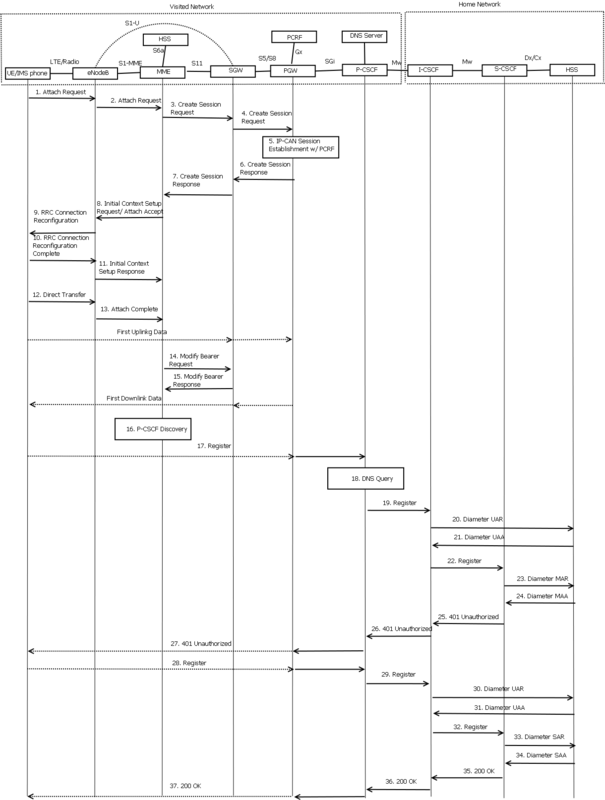 This architecture describes the simplest case where the User Equipment is located in his home network – in the network of the operator he subscribed to. As the picture shows, here only the BBERF (which can be an SGW or a SGSN) is located in the visited network. This implies that the local (visited) PCRF is also to be used when locating the UE. The visited PCRF will contact the home PCRF via the S9 interface. This is the case where basically the entire access network is a visited network as the UE is concerned about. 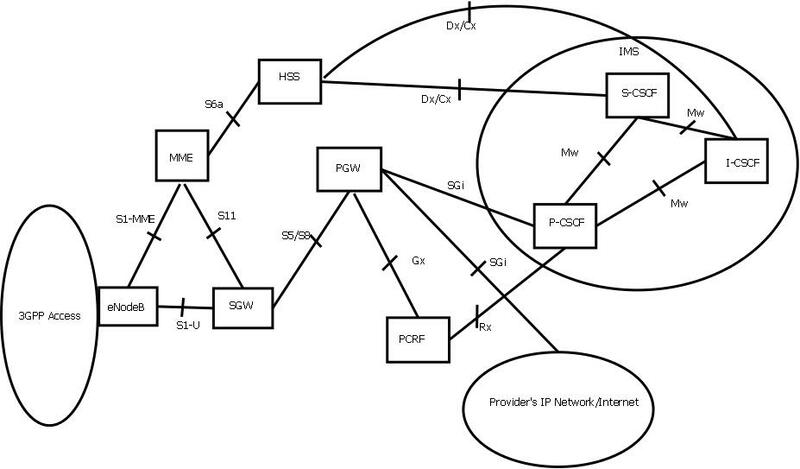 The BBERF (SGW or SGSN) and the PCEF (GGSN or SGW) [at least as far as the 3GPP implementations go…WiMAX guys, please help me out complete this article] are in the visited network. This implies: the use of (at least) the local (visited) PCRF, possibly the use of a local AF and the existence of a local OFCS. This procedure concerns both roaming and non-roaming scenarios. In the roaming case when a Gateway Control Session is used, the V-PCRF should proxy the Gateway Control Session Establishment information between the BBERF in the VPLMN and the H-PCRF over S9 based on PDN-Id and roaming agreements. In the non-roaming case (Figure 5.1.1) the V-PCRF is not involved. 1. The BBERF initiates a Gateway Control Session Establishment procedure as defined in clause 7.7.1 (applicable for cases 2a during initial attach and 2b, as defined in clause 7.1). 2. The GW(PCEF) receives a request for IP‑CAN Bearer establishment. A PDN Connection Identifier may be included in the request. The GW(PCEF) accepts the request and assigns an IP address for the user. 3. The PCEF determines that the PCC authorization is required, requests the authorization of allowed service(s) and PCC Rules information. The PCEF includes the following information: UE Identity (e.g. MN NAI), a PDN identifier (e.g. APN), the IP‑CAN type and the IP address(es), if available, the PDN Connection Identifier received for IP‑CAN Bearer establishment and, if available, the default charging method and the IP‑CAN bearer establishment modes supported. The PDN identifier, IP address(es) and UE identity enables identification of the IP‑CAN session. The IP‑CAN Type identifies the type of access from which the IP‑CAN session is established. If the service data flow is tunnelled at the BBERF, the PCEF shall provide information about the mobility protocol tunnelling encapsulation header. The PCEF may also include the Default Bearer QoS and APN-AMBR (applicable for case 1, as defined in clause 7.1). In case 2a the PCEF may also include charging ID information. 4. If the PCRF does not have the subscriber’s subscription related information, it sends a request to the SPR in order to receive the information related to the IP‑CAN session. The PCRF provides the subscriber ID and, if applicable, the PDN identifier to the SPR. The PCRF may request notifications from the SPR on changes in the subscription information. 5. The PCRF stores the subscription related information containing the information about the allowed service(s) and PCC Rules information. 6. The PCRF makes the authorization and policy decision. 7. The PCRF sends the decision(s) , including the chosen IP‑CAN bearer establishment mode, to the PCEF. The GW(PCEF) enforces the decision. The PCRF may provide the default charging method and may include the following information: the PCC Rules to activate and the Event Triggers to report. The Policy and Charging Rules allow the enforcement of policy associated with the IP‑CAN session. The Event Triggers indicate to the PCEF what events must be reported to the PCRF. 8. If online charging is applicable, and at least one PCC rule was activated, the PCEF shall activate the online charging session, and provide relevant input information for the OCS decision. 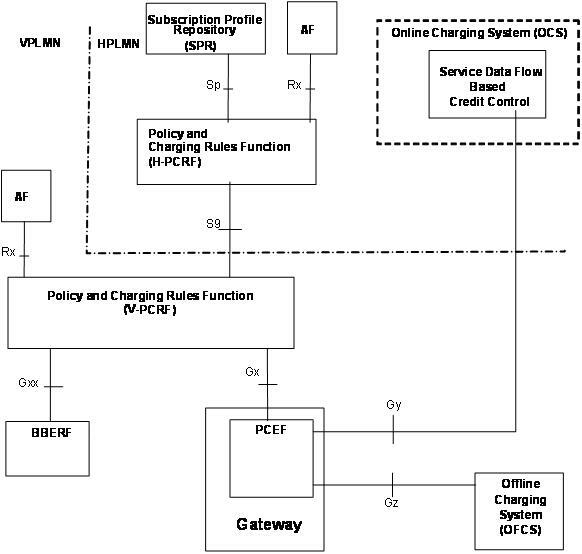 Depending on operator configuration PCEF may request credit from OCS for each charging key of the activated PCC rules. 9. If online charging is applicable the OCS provides the possible credit information to the PCEF and may provide re-authorisation triggers for each of the credits. In cases 2a and 2b if the OCS provides any re-authorisation trigger, which can not be monitored at the PCEF, the PCEF shall request PCRF to arrange those to be reported by the BBERF via the PCRF. 10. If at least one PCC rule was successfully activated and if online charging is applicable, and credit was not denied by the OCS, the GW(PCEF) acknowledges the IP‑CAN Bearer Establishment Request. 11. If network control applies the GW may initiate the establishment of additional IP-‑CAN bearers. See Annex A and Annex D for details. 12. If the PCRF in step 7 requested an acknowledgement based on PCC rule operations, the GW(PCEF) sends the IP‑CAN Session Establishment Acknowledgement to the PCRF in order to inform the PCRF of the activated PCC rules result. Many more information on this on TS 23.203. Insist on the QoS parameter interaction. Din nou: TTC and Robert Greenberg. By the mid 1780s, most of Haydn’s works were immediately published, then heard across Europe and, for that matter, North America as well. Haydn’s music was embraced in Spain, adored in Italy and France as well as in Germany and Austria. The English in particular worshiped – and that is not too strong a word – worshiped Haydn’s music. Between 1781 and 1787, the English Publishing Firm of William Forester published 129 works by Haydn, of which 82 were symphonies, for which Haydn btw received a beaucoup bucks. My my – the word DOES get around….. So, let’s talk about 4G and IMS. This will describe the registration to the IMS core, when the IMS equipment is located in a Visited Network, in roaming. The dotted lines (and arrows) represent the inner IP protocol messages, which are encapsulated in GTPv1-U header. The IMS protocols are just too many and diverse to list here all the TSs and RFCs related to them. The UE initiates the Attach procedure by the transmission, to the eNodeB, of an Attach Request (IMSI or old GUTI, last visited TAI (if available), UE Core Network Capability, UE Specific DRX parameters, PDN Type, Protocol Configuration Options, Ciphered Options Transfer Flag, Attach Type, KSIASME, NAS sequence number, NAS-MAC, additional GUTI, P-TMSI signature) message together with RRC parameters indicating the Selected Network and the old GUMMEI. The old GUTI may be derived from a P TMSI and RAI. IMSI shall be included if the UE does not have a valid GUTI or a valid P TMSI available. The UE stores the TIN in detached state. If the UE’s TIN indicates “GUTI” or “RAT-related TMSI” and the UE holds a valid GUTI then the old GUTI indicates this valid GUTI. If the UE’s TIN indicates “P TMSI” and the UE holds a valid P TMSI and related RAI then these two elements are indicated as the old GUTI. Mapping a P TMSI and RAI to a GUTI is specified in TS 23.003 . If the UE holds a valid GUTI and the old GUTI indicates a GUTI mapped from a P-TMSI and RAI, then the UE indicates the GUTI as additional GUTI. If the old GUTI indicates a GUTI mapped from a P-TMSI and RAI and the UE has a valid P-TMSI signature associated to it, the P-TMSI signature shall be included. If available, the last visited TAI shall be included in order to help the MME produce a good list of TAIs for any subsequent Attach Accept message. Selected Network indicates the PLMN that is selected for network sharing purposes. The RRC parameter “old GUMMEI” takes its value from the “old GUTI” contained in the Attach Request. UE Network Capability is described in UE capabilities, see clause 5.11. If the UE has valid security parameters, the Attach Request message shall be integrity protected by the NAS-MAC in order to allow validation of the UE by the MME. KSIASME, NAS sequence number and NAS-MAC are included if the UE has valid EPS security parameters. NAS sequence number indicates the sequential number of the NAS message. If the UE does not have a valid EPS security association, then the Attach Request message is not integrity protected. In this case the security association is established in step 5a. The UE network capabilities indicate also the supported NAS and AS security algorithms. PDN type indicates the requested IP version (IPv4, IPv4/IPv6, IPv6). Protocol Configuration Options (PCO) are used to transfer parameters between the UE and the PDN GW, and are sent transparently through the MME and the Serving GW. 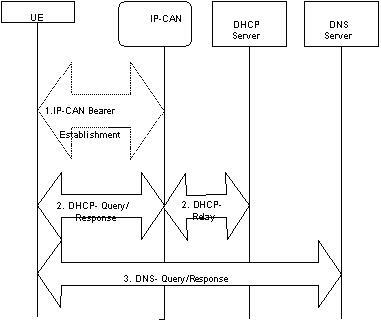 The Protocol Configuration Options may include the Address Allocation Preference indicating that the UE prefers to obtain an IPv4 address only after the default bearer activation by means of DHCPv4. If the UE intends to send PCO which require ciphering (e.g., PAP/CHAP usernames and passwords) or send an APN, or both, the UE shall set the Ciphered Options Transfer Flag and send PCO or APN or both only after authentication and NAS security setup have been completed (see below). If the UE has UTRAN or GERAN capabilities, it should send the NRSU in the PCO to indicate the support of the network requested bearer control in UTRAN/GERAN. Attach Type indicates “Handover” when the UE has already an activated PDN GW/HA due to mobility with non-3GPP accesses. The eNodeB derives the MME from the RRC parameters carrying the old GUMMEI and the indicated Selected Network. If that MME is not associated with the eNodeB or the old GUMMEI is not available, the eNodeB selects an MME as described in clause 4.3.8.3 on “MME selection function”. The eNodeB forwards the Attach Request message to the new MME contained in a S1-MME control message (Initial UE message) together with the Selected Network and TAI+ECGI of the cell from where it received the message to the new MME. If a subscribed PDN address is allocated for the UE for this APN, the PDN subscription context contains the UE’s IPv4 address and/or the IPv6 prefix and optionally the PDN GW identity. In case the PDN subscription context contains a subscribed IPv4 address and/or IPv6 prefix, the MME indicates it in the PDN address. For Attach Type indicating “Initial Attach”, if the UE does not provide an APN, the MME shall use the PDN GW corresponding to the default APN for default bearer activation. If the UE provides an APN, this APN shall be employed for default bearer activation. For Attach type indicating “Handover”, if the UE provides an APN, the MME shall use the PDN GW corresponding to the provided APN for default bearer activation, If the UE does not provide an APN, and the subscription context from HSS contains a PDN GW identity corresponding to the default APN, the MME shall use the PDN GW corresponding to the default APN for default bearer activation. The case where the Attach type indicates “Handover” and the UE does not provide an APN, and the subscription context from HSS does not contain a PDN GW identity corresponding to the default APN constitutes an error case. If the attach type indicates “Initial Attach” and the selected PDN subscription context contains no PDN GW identity the new MME selects a PDN GW as described in clause 4.3.8.1 on PDN GW selection function (3GPP accesses). If the PDN subscription context contains a dynamically allocated PDN GW identity and the Attach Type does not indicate “Handover” the MME may select a new PDN GW as described in clause PDN GW selection function, e.g. to allocate a PDN GW that allows for more efficient routing. The new MME selects a Serving GW as described in clause 4.3.8.2 on Serving GW selection function and allocates an EPS Bearer Identity for the Default Bearer associated with the UE. Then it sends a Create Session Request (IMSI, MSISDN, MME TEID for control plane, PDN GW address, PDN Address, APN, RAT type, Default EPS Bearer QoS, PDN Type, APN-AMBR, EPS Bearer Identity, Protocol Configuration Options, Handover Indication, ME Identity, User Location Information (ECGI), MS Info Change Reporting support indication, Selection Mode, Charging Characteristics, Trace Reference, Trace Type, Trigger Id, OMC Identity, Maximum APN Restriction, Dual Address Bearer Flag, the Protocol Type over S5/S8) message to the selected Serving GW. The RAT type is provided in this message for the later PCC decision. The subscribed APN AMBR for the APN is also provided in this message. The MSISDN is included if provided in the subscription data from the HSS. Handover Indication is included if the Attach type indicates handover. Selection Mode indicates whether a subscribed APN was selected, or a non-subscribed APN sent by the UE was selected.. Charging Characteristics indicates which kind of charging the bearer context is liable for. The MME may change the requested PDN type according to the subscription data for this APN as described in clause 5.3.1.1. The MME shall set the Dual Address Bearer Flag when the PDN type is set to IPv4v6 and all SGSNs which the UE may be handed over to are Release 8 or above supporting dual addressing, which is determined based on node pre-configuration by the operator. The Protocol Type over S5/S8 is provided to Serving GW which protocol should be used over S5/S8 interface. The charging characteristics for the PS subscription and individually subscribed APNs as well as the way of handling Charging Characteristics and whether to send them or not to the P GW is defined in TS 32.251 . The MME shall include Trace Reference, Trace Type, Trigger Id, and OMC Identity if S GW and/or P GW trace is activated. The MME shall copy Trace Reference, Trace Type, and OMC Identity from the trace information received from the HLR or OMC. The Maximum APN Restriction denotes the most stringent restriction as required by any already active bearer context. If there are no already active bearer contexts, this value is set to the least restrictive type (see clause 15.4 of TS 23.060 ). If the P GW receives the Maximum APN Restriction, then the P GW shall check if the Maximum APN Restriction value does not conflict with the APN Restriction value associated with this bearer context request. If there is no conflict the request shall be allowed, otherwise the request shall be rejected with sending an appropriate error cause to the UE. NOTE 7:The Dual Address Bearer Flag is not used when the Protocol Type over S5/S8 is PMIP. The Serving GW creates a new entry in its EPS Bearer table and sends a Create Session Request (IMSI, MSISDN, APN, Serving GW Address for the user plane, Serving GW TEID of the user plane, Serving GW TEID of the control plane, RAT type, Default EPS Bearer QoS, PDN Type, PDN Address, subscribed APN-AMBR, EPS Bearer Identity, Protocol Configuration Options, Handover Indication, ME Identity, User Location Information (ECGI), MS Info Change Reporting support indication, Selection Mode, Charging Characteristics, Trace Reference, Trace Type, Trigger Id, OMC Identity, Maximum APN Restriction, Dual Address Bearer Flag) message to the PDN GW indicated by the PDN GW address received in the previous step. 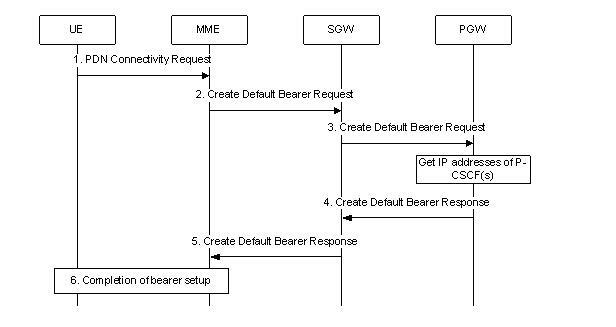 After this step, the Serving GW buffers any downlink packets it may receive from the PDN GW without sending a Downlink Data Notification message to the MME until it receives the Modify Bearer Request message in step 23 below. The MSISDN is included if received from the MME. The P GW creates a new entry in its EPS bearer context table and generates a Charging Id. The new entry allows the P GW to route user plane PDUs between the S GW and the packet data network, and to start charging. The way the P GW handles Charging Characteristics that it may have received is defined in TS 32.251 . The PDN GW returns a Create Session Response (PDN GW Address for the user plane, PDN GW TEID of the user plane, PDN GW TEID of the control plane, PDN Type, PDN Address, EPS Bearer Identity, EPS Bearer QoS, Protocol Configuration Options, Charging Id, Prohibit Payload Compression, APN Restriction, Cause, MS Info Change Reporting Action (Start) (if the PDN GW decides to receive UE’s location information during the session), APN-AMBR) message to the Serving GW. The PDN GW takes into account the received PDN type, the Dual Address Bearer Flag and the policies of operator when the PDN GW selects the PDN type to be used as follows. If th received PDN type is IPv4v6 and both IPv4 and IPv6 addressing is possible in the PDN but the Dual Address Bearer Flag is not set, or only single IP version addressing for this APN is possible in the PDN, the PDN GW selects a single IP version (either IPv4 or IPv6). If the received PDN type is IPv4 or IPv6, the PDN GW uses the received PDN type if it is supported in the PDN, otherwise an appropriate error cause will be returned. The PDN GW allocates a PDN Address according to the selected PDN type. If the PDN GW has selected a PDN type different from the received PDN Type, the PDN GW indicates together with the PDN type IE a reason cause to the UE why the PDN type has been modified, as described in clause 5.3.1.1. PDN Address may contain an IPv4 address for IPv4 and/or an IPv6 prefix and an Interface Identifier. If the PDN has been configured by the operator so that the PDN addresses for the requested APN shall be allocated by usage of DHCPv4 only, or if the PDN GW allows the UE to use DHCPv4 for address allocation according to the Address Allocation Preference received from the UE, the PDN Address shall be set to 0.0.0.0, indicating that the IPv4 PDN address shall be negotiated by the UE with DHCPv4 after completion of the Default Bearer Activation procedure. In case of external PDN addressing for IPv6, the PDN GW obtains the IPv6 prefix from the external PDN using either RADIUS or Diameter client function. In the PDN Address field of the Create Session Response, the PDN GW includes the Interface Identifier and IPv6 prefix. The PDN GW sends Router Advertisement to the UE after default bearer establishment with the IPv6 prefix information for all cases. If the PDN address is contained in the Create Session Request, the PDN GW shall allocate the IPv4 address and/or IPv6 prefix contained in the PDN address to the UE. The IP address allocation details are described in clause 5.3.1 on “IP Address Allocation”. The PDN GW derives the BCM based on the NRSU and operator policy. Protocol Configuration Options contains the BCM as well as optional PDN parameters that the P GW may transfer to the UE. These optional PDN parameters may be requested by the UE, or may be sent unsolicited by the P GW. Protocol Configuration Options are sent transparently through the MME. If the MS Info Change Reporting Action (Start) is received for this bearer context, then the S GW shall store this for the bearer context and the S GW shall report to that P GW whenever a UE’s location change occurs that meets the P GW request, as described in clause 15.1.1a of TS 23.060 . The Serving GW returns a Create Session Response (PDN Type, PDN Address, Serving GW address for User Plane, Serving GW TEID for User Plane, Serving GW TEID for control plane, EPS Bearer Identity, EPS Bearer QoS, PDN GW addresses and TEIDs (GTP-based S5/S8) or GRE keys (PMIP-based S5/S8) at the PDN GW(s) for uplink traffic, Protocol Configuration Options, Charging Id, Prohibit Payload Compression, APN Restriction, Cause, MS Info Change Reporting Action (Start), APN-AMBR) message to the new MME. If an APN Restriction is received, then the MME shall store this value for the Bearer Context and the MME shall check this received value with the stored value for the Maximum APN Restriction to ensure there are no conflicts between values. If the Bearer Context is accepted, the MME shall determine a (new) value for the Maximum APN Restriction. If there is no previously stored value for Maximum APN Restriction, then the Maximum APN Restriction shall be set to the value of the received APN Restriction. If the MS Info Change Reporting Action (Start) is received for this bearer context, then the MME shall store this for the bearer context and the MME shall report whenever a UE’s location change occurs that meets the request, as described in clause 15.1.1a of TS 23.060 . The MME determines the UE AMBR to be used by the eNB based on the subscribed UE-AMBR and the APN AMBR for the default APN, see clause 4.7.3. The new MME sends an Attach Accept (APN, GUTI, PDN Type, PDN Address, TAI List, EPS Bearer Identity, Session Management Request, Protocol Configuration Options, KSIASME, NAS sequence number, NAS-MAC, IMS Voice over PS session supported Indication) message to the eNodeB. GUTI is included if the new MME allocates a new GUTI. This message is contained in an S1_MME control message Initial Context Setup Request. This S1 control message also includes the AS security context information for the UE, the Handover Restriction List, the EPS Bearer QoS, the UE-AMBR, EPS Bearer Identity, as well as the TEID at the Serving GW used for user plane and the address of the Serving GW for user plane. In the Attach Accept message, the MME does not include the IPv6 prefix within the PDN Address. The MME includes the EPS Bearer QoS parameter QCI and APN-AMBR into the Session Management Request. Furthermore, if the UE has UTRAN or GERAN capabilities, the MME uses the EPS bearer QoS information to derive the corresponding PDP context parameters QoS Negotiated (R99 QoS profile), Radio Priority, Packet Flow Id and TI and includes them in the Session Management Request. If the UE indicated in the UE Network Capability it does not support BSS packet flow procedures, then the MME shall not include the Packet Flow Id. Handover Restriction List is described in clause 4.3.5.7 “Mobility Restrictions”. The MME sets the IMS Voice over PS session supported Indication as described in clause 4.3.5.8. If the MME or PDN GW has changed the PDN Type, an appropriate reason cause shall be returned to the UE as described in clause 5.3.1.1. The eNodeB sends the RRC Connection Reconfiguration message including the EPS Radio Bearer Identity to the UE, and the Attach Accept message will be sent along to the UE. The UE shall store the QoS Negotiated, Radio Priority, Packet Flow Id and TI, which it received in the Session Management Request, for use when accessing via GERAN or UTRAN. The APN is provided to the UE to notify it of the APN for which the activated default bearer is associated. For further details, see TS 36.331 . The UE may provide EPS Bearer QoS parameters to the application handling the traffic flow(s). The application usage of the EPS Bearer QoS is implementation dependent. The UE shall not reject the RRC Connection Reconfiguration on the basis of the EPS Bearer QoS parameters contained in the Session Management Request. When receiving the Attach Accept message the UE shall set its TIN to “GUTI” as no ISR Activated is indicated. If the UE receives an IPv4 address set to 0.0.0.0, it may negotiate the IPv4 address with DHCPv4 as specified in TS 29.061 . If the UE receives an IPv6 interface identifier, it may wait for the Router Advertisement from the network with the IPv6 prefix information or it may send a Router Solicitation if necessary. NOTE 10:The IP address allocation details are described in clause 5.3.1 on “IP Address Allocation”. The UE sends the RRC Connection Reconfiguration Complete message to the eNodeB. For further details, see TS 36.331 . The eNodeB sends the Initial Context Response message to the new MME. This Initial Context Response message includes the TEID of the eNodeB and the address of the eNodeB used for downlink traffic on the S1_U reference point. The UE sends a Direct Transfer message to the eNodeB, which includes the Attach Complete (EPS Bearer Identity, NAS sequence number, NAS-MAC) message. The eNodeB forwards the Attach Complete message to the new MME in an Uplink NAS Transport message. Upon reception of both, the Initial Context Response message in step 21 and the Attach Complete message in step 22, the new MME sends a Modify Bearer Request (EPS Bearer Identity, eNodeB address, eNodeB TEID, Handover Indication) message to the Serving GW. The Serving GW acknowledges by sending Modify Bearer Response (EPS Bearer Identity) message to the new MME. The Serving GW can then send its buffered downlink packets. Where do I start? What do I learn first?